While the folk tales and convictions in the Hindu dharma have been great about stories of valor and courage, legendary wars being fought for righteousness and as moral duties, and also of revenge and hatred, seemingly most of them revolve around the powerful patriarchs of the time. But it is also in the scriptures of the Hindu dharma, recorded the accounts of most beautiful women, who have inspires enthralling and enigmatic legends of the time. Their intelligence, beauty, and their courage, all, have changed the course of history. What can anyone say about the beauty of a woman who was god almighty himself, who took the form of a woman and that too to entice the asuras! After Samudra Manthan i.e. the churning of the ocean when devatas and asuras got into a quarrel about the possession of Amrit i.e. nectar of immortality. Then, Lord Vishnu came himself for the solution taking the form of a woman named Mohini (one who attracts) who was so beautiful that asuras couldn’t resist her beauty and forgot all about Amrit giving Mohini the chance to present all the Amrit to devatas. She also beheaded a demon named Rahu who, by deception tried to consume Amrit. Known as an ultimate enchantress, Mohini is one of the most or some say, the most beautiful woman in Hindu Mythology. She was so beautiful that it is believed that even Lord Shiva admired Mohini. What can be said of the woman who is considered as not born of a woman, but morphed from pure creative energy. Yes, you read that right! Ahalya is considered as one of the most beautiful woman ever created. Women with such a charm, and astounding beauty so much that it was never witnessed in all the three worlds before, as the tales have it, was meticulously designed and created by divine architect Vishwakarma having received the orders from Lord Brahma. The name given to her was Tilottama. ‘Til’ means sesame seeds and ‘Uttam’ means of very high quality or best quality, every bit of whose body is perfect, is what the word translates to. As the tales tell, Lord Shiva despite his aesthetic nature and being spellbound to Goddesses Parvati was aroused by her charm and luster emanating from her body. It was such a momentous sight, faces emerged on all four sides of his head so that he could see Tilottama while she was circumambulating around him and goddess Parvati. Goddess Parvati put her hands on his eyes veiling the universe in darkness and thus his third eye emerges. When Nar–Narayan (Nar, later on, took birth as Arjun of Mahabharata, and Narayan was, of course, Lord Krishna) were practicing penance and meditating in Badrinath region, Indra (King of demigods in heaven) got scared, he was so scared, he didn’t want them to acquire divine powers and hence, in order to break their meditation sent two celestial nymphs or apsaras–Rambha and Menaka along with other supporting apsaras. When apsaras told Nar and Narayan that Indra has presented Nar–Narayan the most beautiful apsaras of heaven, in a way being supercilious about her beauty and was extremely proud of herself. He struck his thigh with a flower and from there emerged a woman whose beauty was more than enough to put the apsaras of Indra to shame. She was born from the ‘UR’ part of the thigh and thus was named Urvashi by Narayan. Narayan did so to make apsaras realize that physical beauty and materialistic possessions are not to be so proud of and then asked the apsaras to take Urvashi with them and to present her to Indra from his behalf. Her beauty is unparalleled and after the incident, Urvashi became the glory or the most beautiful apsara of Indra’s court. 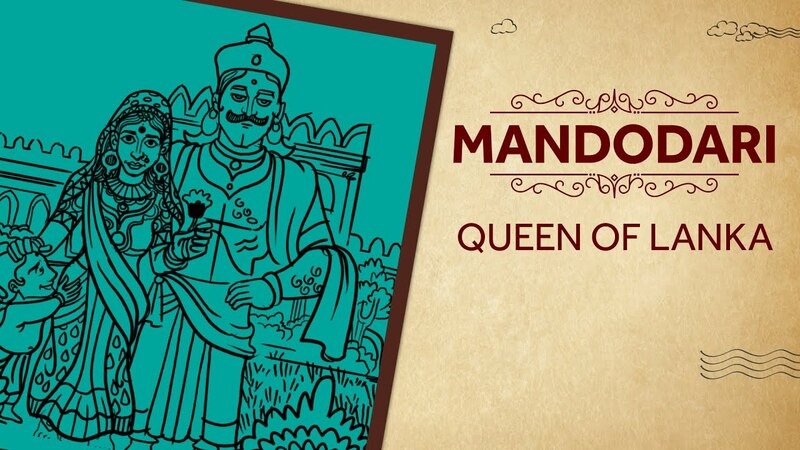 Mandodari, the wife of demon king Raavan, is recognized as one of the most beautiful women in all of the history of Hinduism. Though not much of the light has been shed in the scripture of how beautiful she was, some versions of Ramayan narrate when Hanuman visited Lanka for the very first time, he thought Mandodari to be Sita as the description of Sita’s beauty by Ram and others in meticulous details matched that of Mandodari’s appearance. Princess of Vidharbha kingdom, Damyanti was believed to be extremely beautiful. It was her beauty that made demigods like Indra, Yama, Agni, and Varun come from heaven to participate and marry her in her Swayamvar. But she fell in love with Nala of Nishad kingdom just by listening about his virtues. Described in Vana Parva of epic Mahabharata, Damyanti is one of the most beautiful and revered women in the Hindu tales. An incarnation of Goddess Lakshmi herself, Rukmini is considered as one of the two most beautiful women in Mahabharata. 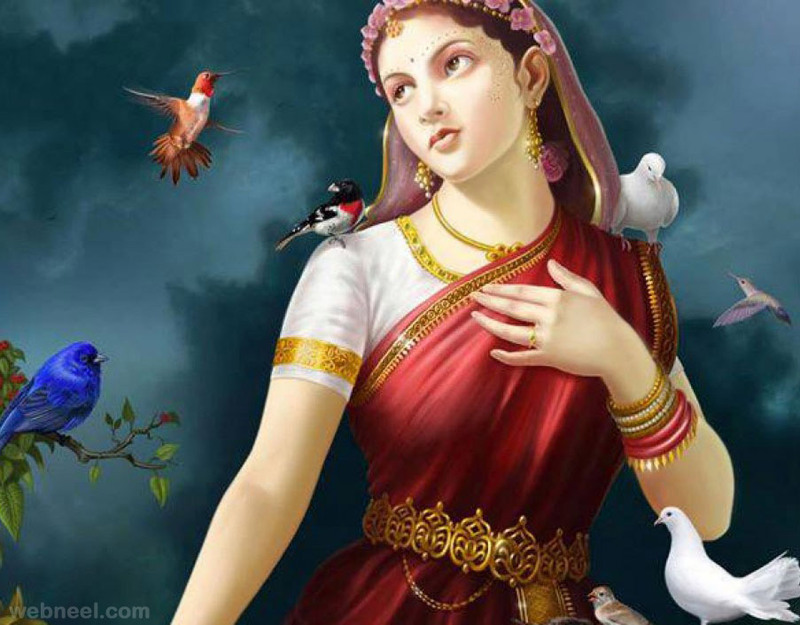 Daughter of King Bheeshmak of Vidarbha, Rukmini was a perfect princess. 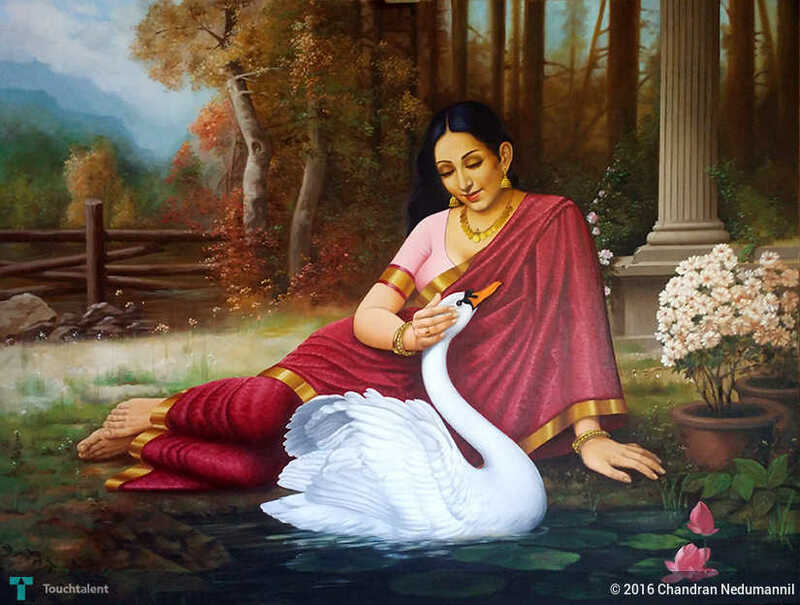 In Mahabharata, it is said that she was such a beauty of Dwaparyug that every king of that era wished to marry her but she was already in love with Lord Krishna whose virtue, valor, gallantry, and charm was enough to make her fall in love with him. The other of the two most beautiful women in the Mahabharata, Rukimini being the first one, Draupadi was born out of the sacrificial fire of Yagna. Her beauty was quite fiery, dark in complexion, Draupadi was a beauty whose Swayamvar was attended by almost all the greatest warrior kings and princes of that era but it was the hero of Mahabharata, Arjun who won her in the Swayamvar. Unlike other women, neither created by God nor born of a women’s womb, she is but a self-manifested form of Goddess Lakshmi in Treta Yug. She was raised by King Janak of Mithila as his own daughter. In Ramayan, it has been said that her beauty was unparalleled and was second to none. It is even written that even Goddess Parvati and Goddess Lakshmi could not match her beauty as they had particular physical appearances and attires because of living in mountains and ocean respectively. But Sita was completely perfect in all the manners possible.. The beauty that she had can be understood by the fact that Raavan (demon king who had conquered the three worlds and who abducted her later) who had all the apsaras or heavenly nymphs, and all the most beautiful women from the three worlds as his maids was spellbound when he, for the very first time had the opportunity to behold her.